H-ELP is unique in its approach to resolving welfare issues associated with the handling of captive and working elephants across Asia. We have a proven evidence-based, scientific approach and this is the main reason for our success. Drawing from all areas of cognitive research and based on the most proven principles to date, the following sections explain how we employ methods that have been successful across a broad range of animal training situations. Combined reinforcement is a relatively recent term in the scientific literature that utilises two domains of operant conditioning in sequence; negative and positive reinforcement. In behavioural science the words positive and negative are used to mean either adding or taking away – they are not indicative of a value judgement. Negative reinforcement is when a something the animal doesn’t want is removed at the onset of a desirable behaviour such as the nagging toe pressure of the mahout on the elephant’s ears for the ‘go’ signal or the tapping of a stick on the elephant’s chest to elicit a step backwards. The elephant then seeks to offer that response at the earliest opportunity in order to avoid the pressure. The lightest touch of that pressure is then learned as the signal and later on a further unrelated signal can be added such as a voice command to produce the same response. Positive reinforcement is when something the animal wants (such as a food or caressing) is given following the onset of a desirable behaviour. In positive reinforcement training, the trainer does his best to ‘set up’ the training so that the response is easily given. One way to enhance the likelihood that the response will be given easily is to use negative reinforcement to hasten the correct response. For example, to raise the leg of the elephant, the leg can be tapped with a stick and the subsequent raising of the leg can be dually rewarded by the stopping of the tapping and the delivery of a food treat. This is combined reinforcement. In the training of the led or ridden animal, combined reinforcement is the most efficient way to train and avoids the vacuousness of sole negative reinforcement and the limitations and frustration that can occur with sole positive reinforcement. Combined reinforcement motivates the elephant to efficiently trial new behaviours while the positive reinforcement amplifies the reward. Now that we have described combined reinforcement, it is important to point out that it makes sense to replace even the lightest of pressures with a totally unrelated signal such as voice command. The reasons for this are twofold. Firstly, replacing even a light pressure with another signal from a totally different sense modality can, in some individuals, have a calming effect. This may be especially true if the light signal has some relationship with stronger more aversive pressures in the animal’s history. Secondly, a voice command can be used at a distance from the animal, giving it greater utility. 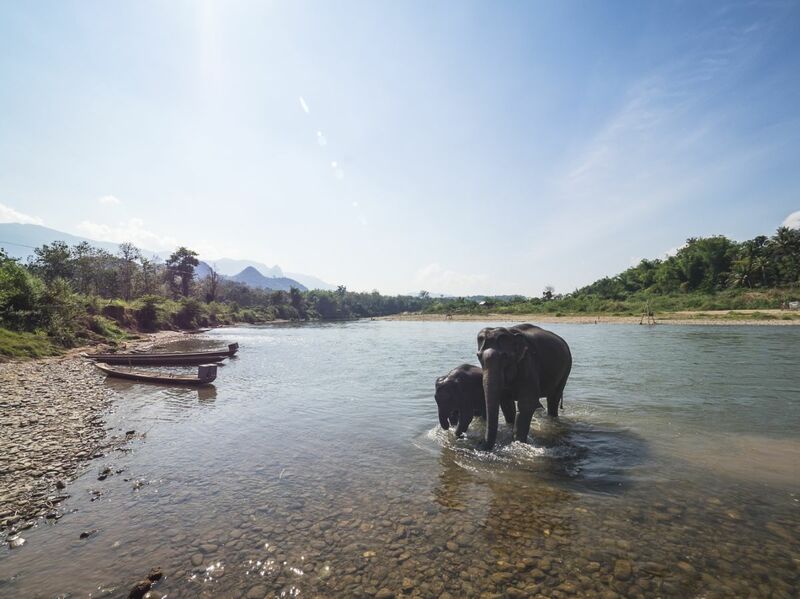 For example, the mahout may need to be on the ground and at a distance while asking the elephant to walk forward, so a voice command can be very useful. How do we install the voice command? When we train an animal to respond to a new signal such as a voice command, the process of learning is known as classical (or Pavlovian) conditioning. While classical conditioning was first coined to describe the acquisition of an unrelated cue to elicit an instinctive response (i.e. the ringing of a bell to elicit salivation in dogs), we now know from neuroscience that the process of acquiring a new, formerly unrelated cue regardless of whether the response is instinctive or learned occurs via the same brain pathways. The most important feature of classical conditioning is its position in the order of events. The new cue must come first. This is true whether you are teaching a dog to sit to or a horse to go forward. So this means that the voice, as a formerly unrelated cue, should occur first. Animal training works most efficiently by a train of events where one event seamlessly dovetails with the next. Let’s say we want to train the elephant to step backwards. Training an elephant to step back is vital because the muscle reactions we are gaining control of are the same as and are a precursor to the training of all deceleration responses (i.e. the brakes!). So the sequence is the voice cue first (in Hindi = Picchu! ), followed by the light pressure (the tapping on the elephant’s foot). If the elephant doesn’t respond we increase the frequency of the tapping and as soon as he responds, we stop tapping (negative reinforcement) and immediately praise (Hindi = Sabash!) then stroke the bulb of the elephant’s forehead followed by food (positive reinforcement). The voice praise also heralds the stroking on the forehead and the delivery of food and so the voice command is also acquired by classical conditioning. When this train of events is done correctly, consistently and efficiently, the use of stronger pressure is no longer required and even the need for the light pressure can be discarded if the correct response occurs from the voice command. The use of food is also faded away so that it occurs only occasionally once the correct behaviour from the voice cue is consolidated. H-ELP’s foundation training program begins with an untrained and barely handled (or not ever handled) young elephant. Groundwork: Establish a single stride forward, and backwards. Groundwork: Develop an increasing number of steps forward, stop and back as well as immobility. Habituate the elephant to a rider gradually mounting and sitting up. Repeat phase 2 with the rider on the elephant sitting passively and giving no signals to the elephant. The rider now gives the signals of go, stop and step back and the handler fades away as the elephant increasingly responds to the commands of the rider. The rider now has complete control of the elephant and practices these manoeuvres in the home environment until reliable. Like horse training, elephant training is a few thousand years old and while this handed-down information has been successful, we now know of even more successful ways to train animals that are not based on punishment for non-compliance. This new information is only half a century old, so it has been absent from the general knowledge of horse and elephant trainers throughout the centuries. Having said that, some elements of the traditional approach are fully aligned with a scientific appraisal so we incorporate these practices in our programs. For example, the words and signals that are used such as using the touch of the mahout’s toes on the elephant’s ear makes good sense. The new scientific approach to animal learning and training first arose in North America with the work of the famous behaviourists Thorndike, Watson, Hull and Skinner as well as the Russian scientist Pavlov. Since these times, the effectiveness of this behaviourist approach has shown the most efficient way to modify learning and training in animals while maintaining the lowest of stress levels. Good dog trainers, just like good trainers everywhere, base their training on the scientific principles that govern learning. This not only makes training more effective it is also the best way to ensure optimal welfare for the animals being trained. Science has shown that certain traditional beliefs and techniques are inherently flawed. The notions of “respect” and “dominance” that have long informed some training techniques have been disproved by science and discarded by ethical animal trainers. These notions have been fertilised by our species’ obsession with hierarchies. The early discoveries on learning were first applied to the education of children, especially those with learning difficulties. Zoos, oceanaria and circuses were soon to follow. In more recent times, dog training was revolutionised by the application of what has come to be known as ‘learning theory’ and even more recently horse training. Horse training bears a striking resemblance to elephant training in that the majority of the training concerns gaining control over the animal’s mobility. The new scientific domain known as equitation science was co-founded by Dr Andrew McLean in the first decade of this millennium and has since grown rapidly. The International Society for Equitation Science (ISES) began in 2005 with its first symposium in Australia with 8 papers on the science that underpins horse training. In just thirteen years, annual ISES conferences have seen more than 1000 scientific papers submitted for presentation. Thus, equitation science is one of the fastest growing fields of science. The reason for this growth is the safety, welfare and efficacy advantages of tailoring training with knowledge of learning theory. In the past decade, many national equestrian federations from Europe to North America and Australia have begun to see the merit of advocating a scientific approach to horse training. The H-ELP approach to elephant training comes from a background of success and a clear cross-species effect. It makes sense to tailor an animal’s training programme with its learning abilities and to sit this within the template of its instinctive natural behaviours or ‘ethogram’ as it is known.